On Tuesday, the United States government kicked off the latest round in what might go down as the largest and most complex auction in human history. If you’ve never heard of this historic bidding war, that might be because the property that is now on the auction block, the national radio spectrum, is entirely invisible. To be sure, we take the spectrum for granted. Every time we watch TV, listen to the radio, or use our smartphones, it is easy to forget that we are making use of a finite natural resource. The right to use this resource is governed by the Federal Communications Commission, which holds complex, algorithmically assisted auctions and assigns right-of-way along the nation’s radio waves to the highest bidder. But this has not always been standard practice. For decades, the federal government parceled out subdivisions of the electromagnetic frontier by conducting hearings and holding lotteries. When the government started selling spectrum in 1994, it was celebrated as a victory for the American taxpayer. The U.S. Treasury is over $100 billion richer thanks to the FCC’s auctions, and governments around the world have come to embrace this innovation with similarly lucrative results. But the advent of the spectrum auction was also an unlikely victory for an esoteric sub-discipline of economic theory—the study of auctions. The task of auctioning off radio waves was a unique economic and logistical challenge that no one had tackled before. Presented with a looming spectrum crisis in the early 1990s that threatened to delay the dawn of the digital age, the FCC did what few federal bureaucracies have done before or since. They turned to a handful of academics and let them put their untested theories into practice. Now, as the possibility of yet another spectrum crisis looms, the FCC is once again counting on a handful of economists and computer scientists to bring order to the ether. The unregulated radio spectrum tends towards anarchy. Meyer had good reason to be frustrated. Just as two cars can’t travel along the same patch of road at the same time without crashing into one another, no two broadcasters can use the same frequency in the same area without causing interference. Even as technological progress has allowed for broader and more efficient use of the spectrum (think wider roads and narrower cars), there is still only so much space to go around. This crowded spectrum, Meyer argued, needed a traffic cop. The public came around to the Navy Secretary’s view two years later. As Ars Technica explains, in the chaotic aftermath of the Titanic disaster in 1912, many blamed amateur radio operators for muddying up the rescue operation and spreading false rumors to the panicked relatives of deceased passengers. Valid or not, those criticisms spurred Congress to pass the Radio Act. The new law required all would-be broadcasters to obtain licenses from the Secretary of Commerce and to stick to their assigned frequencies. Despite the new rules, it took another decade of legal wrangling before it was finally affirmed that use of the radio waves was indeed the “the inalienable possession of the people of the United States and Their Government.” But by 1927, the spectrum, like federal land, was a publicly owned and managed resource. And just like federal land, the government now had to devise a fair system of choosing who would get to use it. For the next five and a half decades, the method of choice was “comparative hearings.” Any radio company (and before long, television broadcaster) who wanted to make use of the public’s airwaves had to go before a panel at the Federal Radio Commission (renamed the Federal Communications Commission in the 1930s). Aside from the negligible application costs, broadcast licenses were given out for free. On paper, these hearings were meant to award applicants who best advanced the “public interest.” Just what was the public interest? Therein lay the rub. The FCC’s reasoning was often opaque and the losers frequently filed lawsuits in protest. At the same time, demand for access to the ether only escalated with America’s television watching habits. With the invention of commercial cell telephones in the early 1980s, things came to a head. Drowning in license applications, the FCC pled with Congress for relief, and in 1983, legislation was passed to allow spectrum licenses to be awarded by lottery. The logic of the lottery was appealing at first glance. Unlike lengthy and litigious hearings, drawing license winners from a proverbial hat was a quick and inexpensive way to work through the backlog of 1,400 cell phone service applications. Plus, given the inherently random nature of this licensing system, no one could claim the license awards were based on politics. In fact, no one could claim the license awards were based on anything, which proved to be a problem. As it turns out, selecting license winners at random sometimes meant that the people who ended up with large tracts of one of the nation’s most valuable natural resources were, well, a little random. People, for example, like the actor Ernest Borgnine. 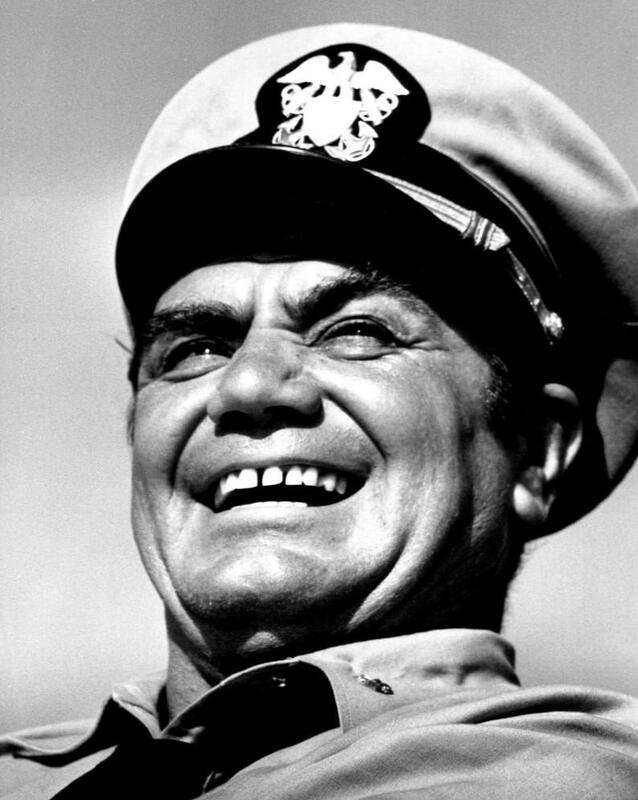 Ernest Borgnine, character actor and one-time spectrum lottery winner. Sometime between working on the CBS series Airwolf and taking a voice acting gig in All Dogs Go to Heaven 2, Borgnine tried his hand at spectrum speculation. As part of a syndicate of lottery participants, the actor was one of hundreds of thousands of citizens who played the cellular telephony lotto in the mid-1980s. According to an article in Forbes from 1990, Borgnine’s group were one of the lucky ones and took home the right to provide cell service to Yakima, Washington, which they then sold for a handsome profit. The active secondary market for lottery-won cell phone licenses that emerged publicized a fact that radio and television industry executives had long known. Since 1927, the government had been distributing billions of dollars worth of spectrum to some of the country's largest companies, absolutely free of charge. Amid growing public concern about the national debt, and as stories of spectrum “application mills” began to pop up in the press, calls for a more remunerative and rational approach intensified. If the government auctions offshore oil drilling rights, coal seams, and seized property, why not spectrum rights too? Given the infeasibility of hearings and the unseemliness of lotteries, lawmakers had no choice but to listen. In 1993, Congress passed a bill calling for the FCC to issue new spectrum licenses by auction. There was no auction mechanism for spectrum in place—not in the United States or anywhere. The Commission was given until the following year to design one. It was time to bring in the economists. The notion of selling spectrum by auction goes back to at least 1951, when the legal scholar, Leo Herzel, floated the idea in the University of Chicago Law Review. The idea was popularized a few year later by the economist Ronald Coase, who lambasted the wastefulness of the FCC’s comparative hearing practice and wondered whether regulation of the “etheric bedlam” was necessary at all. The resistance was not solely bureaucratic intransigence. Unlike oil fields, Treasury securities, and other assets that the government has traditionally sells to the highest bidder, spectrum has some unique features that make it slightly more complicated to auction off. Most significantly, the value of a given license for a bidder often depends on the value of other licenses. Imagine a cell phone company is hoping to build a national network. The government is auctioning off cell phone licenses in an "English" auction—the likes of which you might see at an estate sale or a charity event. Licenses will be sold across the country, so the auctioneer begins with California. A typical "English" auction in London. How much should the company bid for the right to ride the Golden State's airwaves? It will depend on whether or not the company can acquire coverage in every other state. California, as part of a comprehensive national network, is worth more than California by itself. Likewise, the company will want to know how much it is going to spend on all of the other states, so it doesn’t bid over its budget. Plus, what if a competitor decides to take advantage of the company's national ambitions by putting all of its chips on, say, New York, and holding out for a stratospheric price? Economists call the challenge of bidding in this type of auction “the exposure problem.” And it is a problem. Left unaddressed, the strategic uncertainty will lead many participants to under bid, while trapping others in deals that aren’t in their interest. Over time, it will discourage anyone from taking part in the auction. This put the FCC in a very difficult position. Luckily for Kwerel, a couple economists from California had just been hired to think of a workaround. Paul Milgrom says he was skeptical when he got a call from Pacific Bell. The telephone company was hoping to have some say in the design of the FCC's much awaited spectrum auction, and they wanted to hire Milgrom and his colleague at Stanford, Robert Wilson, as consultants. "They came to me and said, 'Well, what do you think of this?'" recalls Milgrom of his first conversation with Pac-Bell. "I said, 'I'm just an economic theorist! I don't know anything!'" Milgrom had been researching auction theory since the late 1970s, but that didn't mean he had spent much time studying actual auctions. 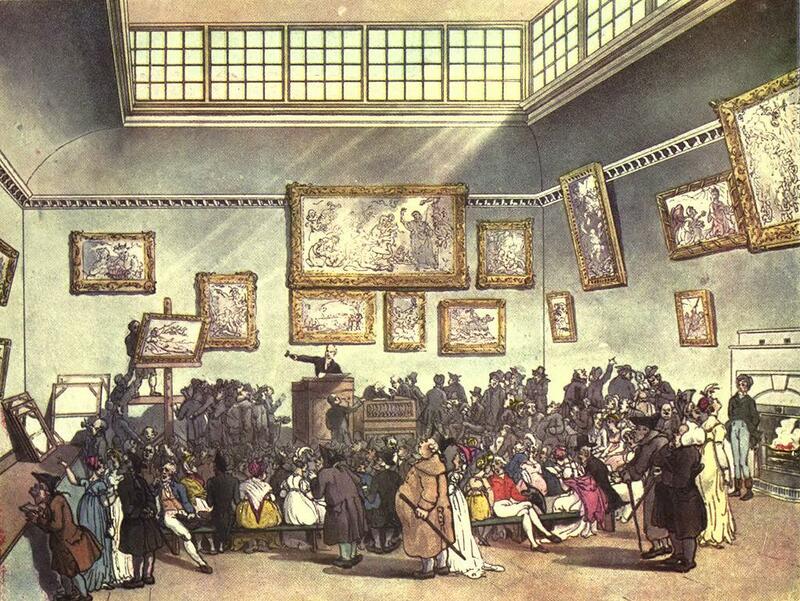 Borrowing many of the analytical tools from game theory, the study of auctions offers a mathematically rigorous, but not terribly representative depiction of the real world. Even in the stylized universe of academic economists, many still regarded auction theorists as a somewhat heterodox. Nevertheless, Milgrom and Wilson got to work. The challenge before them was to set up an auction in which multiple bidders could bid on multiple licenses in multiple markets without running into the exposure problem. "So we came up with a method to set prices simultaneously, so that bidders would have some idea what the prices were in other areas," says Milgrom. "If I'm trying to decide whether I'm going to be able to afford Chicago and Los Angeles, I want to know what the overall prices everywhere else are first, and the auction would provide a lot of information on that." This was the conceptual core of Milgrom and Wilson's simultaneous ascending auction. In practice, the form was very similar to the "English" auctions you might see at Christie's. Only instead of taking place in a room full of well heeled collectors all bidding on the same painting, this auction would take place within a computer network full of multinational corporations bidding for every commercially available segment of the electromagnetic spectrum at once. To see how this might work in practice, imagine a very simple example. Two companies are bidding on cell phone licenses in San Francisco and Chicago. Company A is interested in the Bay Area market, while Company B is only willing to pay a premium for Chicago if it can land the San Francisco license too. In each round, the two companies will submit bids on the licenses that they are interested in acquiring. In the above example, Company A might place $500,000 on San Francisco, while Company B might submit $510,000 on both. When the round ends, both companies will be able to view the highest bid in each market and, now having some understanding of the preferences of their competitor and the likely trajectory of prices in each market, they can adjust their strategies accordingly before making their bids in the second round. The auction finally ends when a round passes in which no bids are made on any of the licenses. In 1994, the concept was well understood in theory. Even the FCC was aware of it. As far back as 1985, the Commission's Evan Kwerel and his colleague, Alex Felker, had suggested developing a system in which all of available licenses would be bid upon at the same time. This hypothetical auction would clear up much of the uncertainty about license prices across different markets. But clearly, there was quite a bit of devil in the details. It was left to Paul Milgrom to convince the FCC that they had rooted them out. Together with a research assistant, Milgrom programmed a workable prototype of the auction design into an Excel spreadsheet. Then he loaded up the file onto the 1993 equivalent of Dropbox and headed to Washington D.C.
"I actually showed up to one of my visits to the FCC with a three-and-a-half inch [floppy] disk with two Excel spreadsheets on it—one to show how the FCC program would run and one to show what a bidder could do," he says. The message he was trying to convey was clear: "People will tell you it can't be done. Well, it could be done—I'm not recommending you do it with an Excel spreadsheet—but you could!" This was cutting edge stuff at the time, says Milgrom. Had Pacific Bell approached Milgrom and Wilson any earlier, the simultaneous ascending auction would not have been possible. Milgrom and Wilson's work was as much about mathematics and computer science as it was economic innovation. With some additional input from Preston McAfee, a University of Texas economist who had been hired by the cell phone company AirTouch (and who is now the chief economist at Microsoft), the FCC signed off on the untested design and held the world's first simultaneous ascending auction in July of 1994. 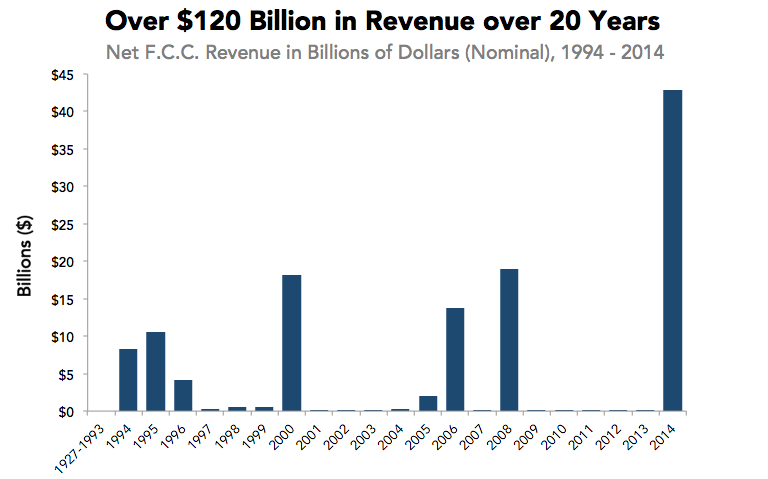 Ten licenses were sold over the course of 47 rounds and the FCC brought in $617 million. Not a bad haul for an agency that had been giving out spectrum for free since 1927. In the immediate aftermath, the auction was heralded as an outstanding success for market-oriented policymaking and sound fiscal stewardship. The following year, after the FCC held its fourth and largest spectrum auction yet, the conservative columnist William Safire declared it "the greatest auction in history" and a "taxpayers' bonanza." Since then, writes auction theorist Peter Cramton, the simultaneous ascending auction has become the “workhorse of spectrum auctions” around the world, where it has generated revenue in excess of $200 billion. It has also been taken up, with some modifications, in other settings, such as in electricity and gas markets. Data source: Federal Communications Commission; chart by Priceonomics. The approach was even proposed by the English author and economist, Tim Harford, as a method for deciding who ought to get which room in a crowded house. Asked whether he was aware that the auction model he helped to design was being put to such prosaic use, Milgrom warned that, in fact, the rent application is “trickier than it seems.” Unlike the spectrum context, bids among housemates must sum to a specific value—namely, the rent. Instead, he says, he refers inquiring students to the website Spliddit. Still, while the incontrovertible usefulness of the simultaneous ascending auction has earned Milgrom, Wilson, and McAfee plenty of accolades and awards, there have been bugs along the way. In 1996, for example, it was discovered that a cellular carrier, Mercury PCS, had found a way to collude with competitors by including license area codes in the last three digits of its bids. For example, a bid of $1,615,264 in Amarillo, Texas was meant to tell a competitor to stay out of the nearby Lubbock market, known as license area 264. Likewise, another flaw—this one potentially more fundamental—came to light in an auction ten years later. In 2006, a consortium of cable companies, including Comcast and Time Warner, were able to exploit a quirk in the auction design that made it more difficult for bidders to move from one type of license to the other. This allowed the consortium to walk away with national coverage at a multibillion-dollar discount. Over the years, these loopholes and glitches have led the FCC to tinker with the basic design. They have also encouraged other countries to modify the original 1994 model when constructing their own spectrum auctions. In much of Europe, for example, bids are not made on individual licenses, but on "packages," which represent a wish list of licenses across a region and across the spectrum. This makes for an auction process that would have been computationally out-of-reach in the era of floppy disks, but which more recent innovations have made possible. 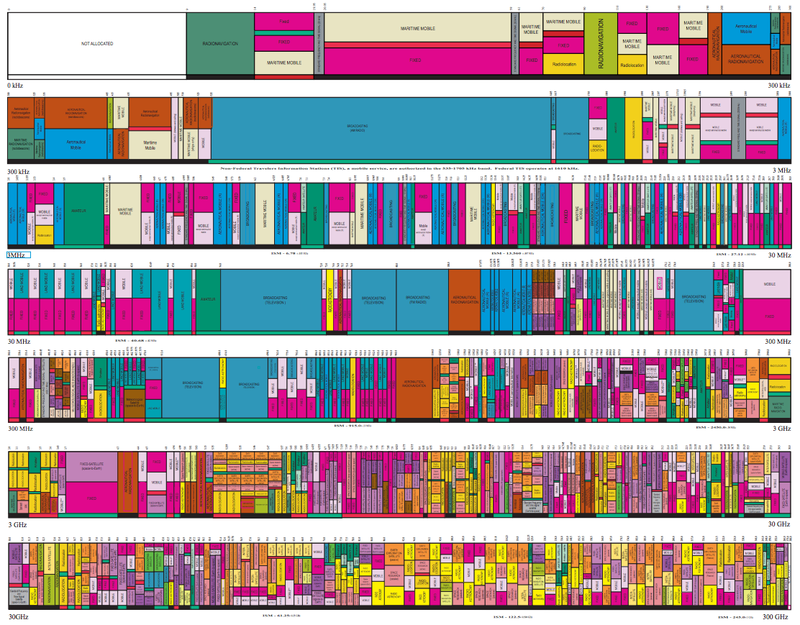 Likewise, as the demand for spectrum in the United States once again seems ready to outstrip supply, the latest innovations in market design and computer science have been used to manufacture the largest and most complex auction yet. For years, the threat of a looming spectrum shortage has struck fear into the hearts of telecom executives and federal regulators alike. While the demand for new spectrum, in the form data hungry smartphone usage, shows no sign of abating, the supply of spectrum, as always, is fixed. Milgrom is well positioned to know. Once again, he has played the role of market designer. Though the FCC's decade-spanning spectrum reallocation scheme is called an "Incentive Auction," it is in fact two auctions. The first, which began at the end of March, was in every way an inversion of the typical model. Rather than serve as the single seller of spectrum before a host of bidders, the FCC was the lone buyer in a "reverse" auction. And unlike a traditional ascending auction, in which prices begin low and end high, the FCC started high and sought out TV broadcasters willing to sell at the lowest prices. Evidently, these broadcasters drive a hard bargain. When the reverse auction closed at the end of June, the FCC had acquired commitments from them to supply 126 MHz of spectrum at a price of $86.4 billion. To be clear, these funds are not coming out of government coffers. The FCC is simply playing the role of middleman in a massive spectrum recycling program. Now, starting this Tuesday, the Commission is in the process of rounding up potential buyers with its "forward auction." This second phase of the process looks much more like traditional FCC fare, but with a few important changes. In the forward auction, bids are not tied to a specific frequency, but are made for generic spectrum in a particular region. Likewise, unlike a traditional English auction in which the auctioneer fields potential prices from bidders, the FCC will raise prices in fixed steps in each round and ask all bidders how much spectrum they are willing to purchase at that price. Both changes are intended to standardize the bidding process across markets, which are intended to help the FCC match the supply of the TV broadcasters with the demand of the wireless carriers. On that note, some are less optimistic than others. "They're completely nuts," said industry analyst, Roger Entner, referring to the TV broadcaster's high price tag. "The wireless industry, even with private equity and cable, I don't see has a chance of raising that much." And if that's the case, the FCC will have to start the entire process over again. The fate of the unobstructed flow of digital information will have to wait. That will keep Paul Milgrom and his team busy. Though Milgrom says he cannot get into the details of the incentive auction design until the process is complete, the repackaging of unwanted frequency to meet the demands of wireless carriers is evidently a mammoth logistical and economic challenge. "The computations that the FCC has to do in real time now are unprecedented," he says. "I think this is the most exciting thing I've ever done." No doubt, the last time Milgrom said that, he reshaped an entire industry and gave governments around the world a tool to collect hundreds of billions of dollars in extra revenue. Let’s hope this experiment goes just as well. Our next article explores why Americans are no longer among the world's tallest people. To get notified when we post it → join our email list.